BURBANK, CA – The Martial Arts History Museum received a generous, undisclosed donation today from Dr. Robert Goldman to benefit the growth and operation of the Museum. The Museum, which is celebrating its 15th anniversary, was also honored to receive a 15-year commitment from Dr. Goldman to support the facility to keep the history of the martial arts alive for future generations. “I am inspired about what the Museum is doing and would like to commit over $15,000 over the next 15 years,” notes Dr. Goldman. Dr. Robert Goldman, a physician and surgeon, is recognized as a pioneer in the world of anti-aging medicine. He is a Fellow of the American Academy of Sports Physicians and a Board Diplomat in Sports Medicine and Board Certified in Anti-Aging Medicine. Goldman is also Chairman of the International Medical Commission overseeing sports medicine committees in more than 184 nations. Goldman visits an average of 20 countries annually to promote sports medicine programs. 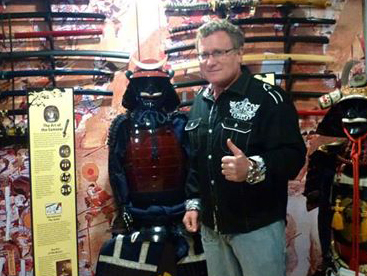 Dr. Goldman is a strong supporter of the Museum and has also loaned an authentic Samurai Sword to be put on display for all to enjoy. The Martial Arts History Museum is an informative and cultural facility providing an educational understanding of diverse cultures and revealing how Asian history became part of American history through the martial arts. The Museum is a Non-Profit 501(c)(3) organization and is available for accepting donations, support and grants. Visit www.MAmuseum.com for more information.